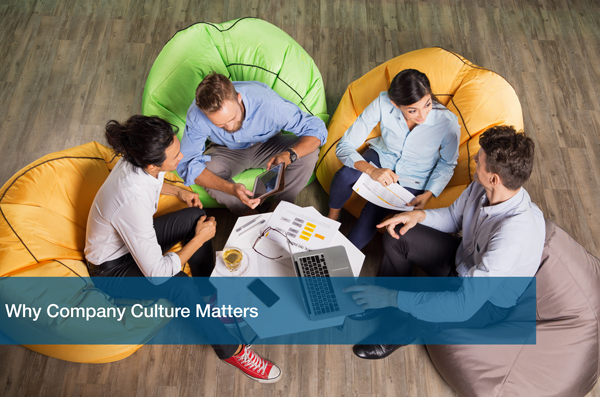 Culture is defined as the values, beliefs, and practices shared by members of a group. Therefore, company culture is the shared values, practices, and beliefs of the company’s employees. Not everyone is the same, but they can share values that create the company’s culture. The workforce has seen a huge wave of millennial workers in the past few years. One thing these millennials have in common is one question they all ask in job interviews: what is your company’s culture like? When looking for a job, people want to know what the work environment is like at your company. How are the people? What values do they treasure? Is everyone a team player? Is it a “do everything on your own” type of office? Developing your company’s culture is essential to creating a successful team of employees. In a previous post we talked about The Benefits of Technology on Small Businesses. But first things first. Develop a company culture that potential employees will want to be a part of. Have you ever heard someone say “We have a Silicon Valley style of office”? This means they have a fully stocked kitchen for their employees and an open space floor plan to promote team collaboration. Most Silicon Valley offices are designed this way and it works! As Austin becomes the next Silicon Valley, most companies are adopting this “startup vibe”. How flexible is the job? Can you work from home? Is the process for requesting time off impossible to complete? Having flexibility is essential because it shows your employees that their job can adapt to fit their needs. Things happen and sometimes you must stay home. Car broke down or your child woke up with a fever. Sometimes you just can’t make it into the office. Letting your employees have flexibility in their role will increase their morale and will overall have a positive effect on the company’s culture. “I want to work in a company where I’ll have the potential to grow.” Ring any bells? Having the chance to grow as an employee is one of the main things people look for in jobs. Life is changing and technology is evolving. There is always something new to learn, so there should always be a chance to grow. Giving your employees the chance the climb the ladder of success will create company pride and will help ensure they stick around in the long run. Of course this is the most important. Diversity in the workforce is growing, and each and every individual adds something unique to the team. What makes our company special? The team. The way we vibe together. The way we can bounce ideas off each other with ease. Sometimes even finishing each other’s sentences! The team is what will make your company shine. Take care of your team and they will take care of your clients. Your company’s culture is what makes you unique. It adds a voice to your business. It shows your mission and your core values. Sometimes the culture forms by itself through your employees. There’s nothing better than working for a company that you can be proud of. That’s why ITC is here to ensure that your team has all the technology tools they need to stay connected both at and away from the office. Schedule a free IT analysis with one of our experts and find out how ITC can help your business today.